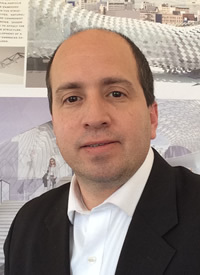 Juan Ayala teaches urban design skills and the application of graphic communication to the processes involving planning, implementation, urban design, architecture, and visioning. His digital design skills originate from an understanding and practice of the traditions in hand drawing and the composition of analogue media. For his classes, Juan demonstrates the evolution of a planning project based on the decisions made from the emerging information found in the sequence of drawings. His research interest is an expansion of his professional experience — to discover meaningful ways to achieve design solutions through logic, reasoning, science and technology. He aims to teach future generations of planners how to read, comprehend, and create site plans and become part of the design team of professionals. Juan is a co-founder and managing principal of GRID Design Studios LLC. He is a highly skilled design professional with national and international experience in managing and designing complex architectural, urban design, planning and community design projects. He has 22 years of experience in leading a wide range of projects from small towns and resorts to large mixed-use urban development/redevelopment projects. Juan is a registered candidate of the National Council of Architectural Registration Board.